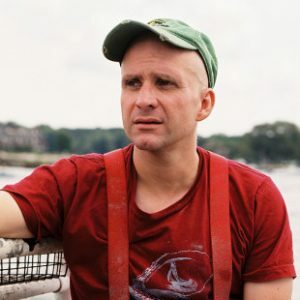 Like so many working to transform the food system, my perception of farming ended at the shoreline, so Bren’s work—featured on his Kickstarter campaign two years ago—which was to build the nation’s first multi-species vertical ocean farm in Long Island Sound off of Stony Creek, Connecticut, was a total revelation. It took only one trip with him on his boat to see the demonstration farm off the Thimble Islands and listen to the story that you’re about to hear to realize that this was something—and someone!—revolutionary. The farm’s simple and accessible infrastructure supports sea vegetables and bivalves, humble plants and creatures that we should be grateful for because they have the potential to be our ecological salvation. And Bren’s reverence for the commons and his innovative model of scaling by means of replication are radical yet have the pragmatic ability to effect real change. Bren possesses the uncommon ability to successfully see the big picture and attend to the day-to-day, often grueling detail work on the ground—or in this case, on the water. He has the prescience to envision a new paradigm in which our coastal economies, our communities, and our oceans are restored with a healthy benefit for all and where “kelp will be the new kale”! He also has the courage to point out when the emperor isn’t wearing any clothes, such as last year when he became the lightning rod of the food movement with his New York Times OpEd that went viral, titled “Don’t Let Your Children Grow Up to Be Farmers,” in which he called out the harsh economic realities and high barriers facing beginning and small-scale farmers. Bren has been profiled by CNN, The New Yorker, Bon Appetit, The Wall Street Journal, and in National Geographic Television’s “Future of Food” series. He’s been chosen as an “Ocean Hero” by Oceana and as the Future of Fish’s “Ocean Entrepreneur” of the year. An Echoing Green Climate Fellow and an Ashoka Fellow, Bren was also honored earlier this month by President Bill Clinton at the Clinton Global Initiative. And I’ve been given permission to reveal to you that he will be profiled in the upcoming food issue of The New Yorker that will be on the newsstands next week. If that isn’t enough, the day before yesterday it was announced–as some of you already know–that Bren is this year’s winner of the Buckminster Fuller prize. Please join me in welcoming Bren Smith. I’m here as a fisherman who dropped out of high school. I’ve spent many nights in jail over my lifetime; I’m an epileptic; I’m asthmatic; I don’t even know how to swim. So I’m here today, humbled in many ways, and I told my wife, Tamanna, that I don’t feel as though I deserve to be here. But since I’ve snuck in the back door somehow, I’ll tell you my story. It’s a story of ecological redemption. I was born and raised in Newfoundland, Canada, in a little fishing village with fourteen salt-box houses painted in greens, blues, and reds so that fishermen could find their way home in the fog. At age fourteen I left school and headed out to sea. I fished the Georges Banks and the Grand Banks for tuna and lobster, then headed to the Bering Sea, where I fished cod and crab. The trouble was I was working at the height of the industrialization of food. We were tearing up entire ecosystems with our trawls, chasing fish further and further out to sea into illegal waters. I personally have thrown tens of thousands of by-catch back into the sea. But then in the early 1990’s the cod stocks crashed back home: thousands of fishermen thrown out of work, boats beached, canneries shuttered. This situation created a split in the industry: the captains of industry, who wanted to fish the last fish, were thinking ten years down the road, but there was a younger generation of us thinking fifty years out. We wanted to make our living on the ocean. I want to die on my boat one day—that’s my measure of success. So I kept searching, ending up on Long Island Sound, where there was a new program in place to attract young fishermen back into the industry by opening up shell-fishing grounds for the first time in 150 years. I signed up, leased some grounds from the state, and re-made myself as an oysterman. I did this for seven years. Then the storms hit. Hurricane Irene and Hurricane Sandy thrashed the East Coast. Two years in a row the storms buried 90% of my crops in three feet of mud, and 40% of my gear was washed away in a sea of death. At the same time, lobster was being driven northward by warming waters, and acidification was increasing faster than at any other time in 300 million years, killing billions of oyster seed up and down our coasts. Suddenly I found myself on the front lines of a climate crisis that had arrived one hundred years earlier than expected. For a long time I’d seen climate change only as an environmental issue because environmentalists were always framing it in terms of birds, bears, and bees, but I’m a fisherman. I kill things for a living; I grew up shooting moose out of my kitchen window. I never thought climate change had anything to do with my life. But it does. From my vantage point, climate change is not an environmental issue at all—it’s an economic issue. The same years my farm was wiped out by hurricanes, 83,000 people lost their jobs in New York City because of flooding, many of those in manufacturing. Unemployment claims doubled in Vermont along the storm’s path, and 80% of U.S. farmland was shriveled by drought, driving up food prices for middle and working class families. It turns out there will be no jobs on a dead planet. After my farm was destroyed, it was clear to me that I had to adapt because I was facing a serious threat to my livelihood. I began to re-imagine my occupation and farm. I began experimenting and exploring new designs and new species. I lifted my farm off the sea bottom to avoid the impact of storm surges created by hurricanes and started to grow new mixes of restorative species. Now, after twenty-nine years of working on the oceans, I’ve remade myself as a 3D ocean farmer, growing a mix of seaweeds and shellfish for food, fuel, fertilizer, and feed. 3D Ocean Farming Animation by GreenWave. If you look for my farm from ashore, there’s almost nothing to see, which is a good thing. Our underwater farms have a low impact aesthetically. That’s important because our oceans are beautiful pristine places, and we want to keep them that way. Because the farm is vertical, it has a small footprint. My farm used to be 100 acres; now it’s down to 20 acres, but it produces much more food than before. If you want “small is beautiful,” here it is. We want ocean agriculture to tread lightly. First, food production. As ocean farmers, we reject aquaculture’s obsession with monoculture, similar to that of land farming. Our goal is diversity. 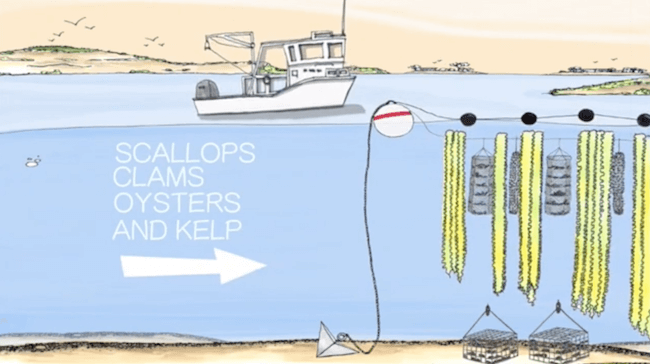 It’s a sea-basket approach: we grow two types of seaweeds, four kinds of shellfish, and we harvest salt. But with over 10,000 edible plants in the ocean, we’ve barely scratched the surface. We eat only a few species, and we grow basically none in the United States. We intend to de-sushify seaweed and invent a new native cuisine, not around our industrial palate of salmon and tuna but around the thousands of undiscovered ocean vegetables that are right outside our backdoor. Native seaweeds contain more vitamin C than orange juice, more calcium than milk, more protein than soybeans. And it might surprise those of you on the hunt for Omega-3s to learn that many fish do not create these heart-healthy nutrients by themselves—they consume them. By eating the plants fish eat, we get the same benefits while reducing pressure on fish stocks. So it’s time to eat like fish. We’re working with chefs to cook up kelp noodles with parsnips and bread crumbs in barbeque sauce; green sea butters and cheeses; kelp-based umami-filled bouillons. Our new ocean dinners are fun, they’re creative, and they’re delicious. This is our opportunity to completely rearrange the seafood plate by moving ocean plants and bivalves to the center and wild fish to the edges. Imagine being a chef in 2015 and discovering that there are thousands of vegetable species you’ve never cooked with before. It’s like discovering corn, arugula, tomatoes, lettuce for the first time. As one of my partner chefs, Brooks Headley, says, “As a chef it feels frightening, daunting, and exciting all at once.” Ocean greens such as kelp are not small boutique crops. We can grow incredible amounts of food in small areas: 25 tons of greens and 250,000 shellfish per acre in five months. If you were to create a network of our ocean farms totaling the size of Washington state, technically you could feed the planet. 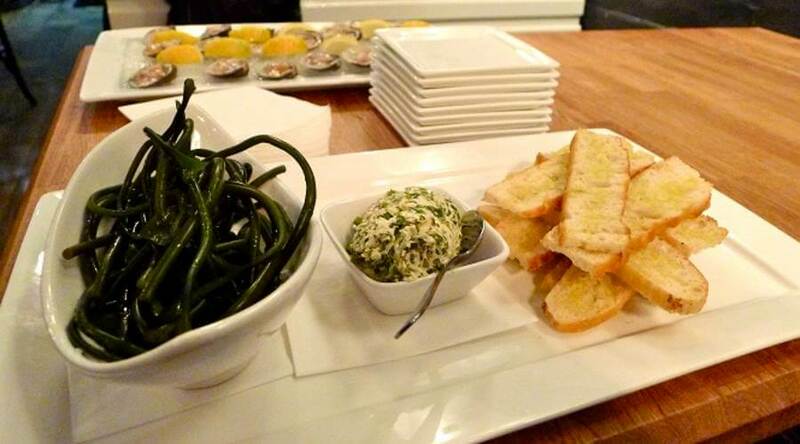 Pickled kelp, crostini with kelp butter and Thimble Island clams / Thimble Island Ocean Farm. This is zero-input food that requires no fresh water, no fertilizer, no feed, no arid land—making it hands down the most sustainable food on the planet. And as the price of fertilizer, water, and feed goes up, zero-input food is going to be the most affordable food on the planet. The economics of it will drive us to eat ocean greens. The question is, will it be delicious food or will it be like being force-fed cod liver oil? As farmers, it’s our job to grow this new cuisine, and for chefs it’s their job to make it beautiful. Ocean farming isn’t just about food. It’s about transforming an entire workforce, transforming fishers into restorative ocean farmers. My job has never been to save the seas; it’s to figure out how the seas can save us. I say that because millions of years ago Mother Nature created two technologies designed to mitigate our harm: shellfish and seaweeds. Oysters filter up to 50 gallons of water a day, pulling nitrogen, which is the cause of our oceans’ spreading dead zones, from the water column. 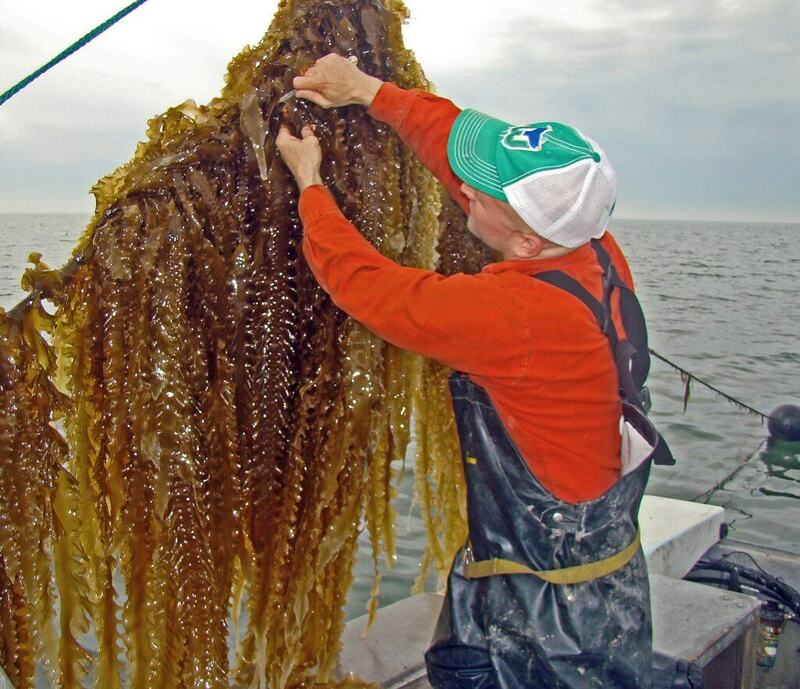 Our farmed kelp, called the Sequoia of the sea, soaks up five times more carbon than land based plants. Seaweeds are a powerful source of zero-input biofuel; we can produce 2,000 gallons of ethanol per acre—that’s a 30 times higher yield than soybeans and five times more than corn. According to the Department of Energy, if you were to take a network of our farms equaling half the size of the state of Maine, you could replace all the oil in the United States. Our farms function as storm-surge protectors, breaking up wave action to reduce the impact of hurricanes and rising tides. And they serve as artificial reefs, attracting over 150 species. Sea horses, striped bass, and grey seals come to eat, hide, and thrive on our farms. My farm used to be a barren patch of ocean, now it’s a flourishing ecosystem. As fishermen, we’re no longer pillagers, hunting the last fish. We are a new generation of climate farmers who have joined the fight to restore our planet. We’re trying to break down the seawalls that separate our land-based and ocean-based food systems. Even the best land-based farms pollute, sending nitrogen into our waterways, so we use our kelp to capture that nitrogen, turn it into liquid fertilizers, and send it back to organic farmers to grow their wonderful vegetables. When the nitrogen then runs back into Long Island Sound, we capture it again. We are also working on new forms of livestock feeds. For example, when cattle are fed a majority kelp-based diet, there is a 90% reduction in methane output. The idea is to build a bridge between land and sea in order to close the loop between our food systems. As Lisa said in her introduction, too often our thinking stops at the water’s edge. Our goal is to build a just foundation for the blue-green economy. Saving the seas is not enough. There is 40% unemployment in my town. I wouldn’t be doing this work unless it created jobs for my people, unless it opened up new opportunities for the three billion folks who depend on our oceans to make a living. Our old economy is crumbling. I can’t get cell service in half of the country, let alone decent healthcare or a healthy meal. The old economy is built on the arrogance of growth at all costs, profiting from pollution, and the refusal to share economic gains with 99% of Americans. But out of the ashes of the old economy, together we are building something new based on new-economy principles of collaboration, community-driven innovation, shared profits, and meeting social needs. Because ocean agriculture is still in its infancy, we have the unprecedented opportunity to build a model from scratch, to build from the bottom up an economy that works for everyone, not just a few. We have the opportunity to learn from the mistakes of industrial agriculture and aquaculture. This is our chance to do food right. We addressed the first question of farm replication and scale, not by patenting or franchising—those are tools of the old economy—but by open-sourcing our farming model so that anybody with 20 acres and a boat and $30,000 can start his or her own farm. One of our new farmers is a third-generation lobsterman who was unemployed because climate change had pushed lobsters northward. We got him up and running, growing and selling the first year. Among our other farmers are former Alaskan salmon fishermen, an Iraq war veteran, and a Latino family whose ancestors were driven off their farmlands in Mexico. We replicate and scale by specifically designing our farms to require low capital costs and minimal skills. We seek simplicity not complexity. We believe that replication is driven by setting low barriers to entry so that people from all walks of life can grow and prosper with us. At the same time our farmers receive start-up grants, access to free seed, gear donated by Patagonia, and two years of free consulting from GreenWave. What is most important, we guarantee to purchase 80% of their crops for the first five years at triple the market rate. We envision 3D farms embedded in wind farms, harvesting not only wind but also food, fuel, and fertilizers. We envision using shuttered coal plants—like the one closing in Bridgeport, Connecticut—for processing animal feed and salt. We want to repurpose the fossil-fuel and fishing industries so that they will protect rather than destroy our oceans. Instead of repeating history we’re building infrastructure from seed to harvest to market. We’re starting non-profit hatcheries so that our farmers can access low-cost seed. We’re creating ocean seed banks so that the Monsantos of the world can’t privatize the source of our food and livelihoods. We cap the price of a sublease at $50 an acre per year so that low-income ocean farmers can access property. But by “property” we do not mean privatization. Our farmers don’t own their patch of ocean; they own only the right to grow shellfish and seaweeds there, which means that anyone can boat, fish, or swim on their farms. I own the process of farming but not the property, and this keeps my farm as shared community space. We’re also building in levers of community control. Leases are up for review every five years so that if I’m farming unsustainably, my rights can be revoked. Harvesting kelp. Photo courtesy of Bren Smith. At the same time, we’re building the country’s first farmer-owned seafood hub, which is not only a place to process, package, and ship the raw commodities we raise but also a space to leverage the unique qualities of our seaweeds. The power of kelp is that it’s not just food; there is a whole range of products we can produce that meet environmental and social needs: organic fertilizers, new livestock feeds, kelp biofuels, and even medicine. With thousands of yet undiscovered ocean plants, farmers and scientists can join together to discover and grow new forms of medicine. We believe that if we provide our communities with the right mix of low-cost, open-source infrastructure, our hub will become an engine for job creation and the basis for inventing entirely new industries. It will also be an engine for food justice, a place where we embed good jobs, food access, and nutrition into the DNA of ocean agriculture. This means, for example, working with local grassroots groups like CitySeed in New Haven, Connecticut, to ensure that low-income folks can use food stamps to carry double the value at our Community Supported Fisheries and our Beyond Fish retail store. It also means using our hub as a hiring hall where local workers can find jobs on our farms, in our start-ups, in our kitchens. And if you come to the hub for a job, don’t bring your resumé. We don’t care if you are a former felon or an undocumented immigrant; we’re going to put you to work. The final challenge is how to re-arrange the relationships between those of us who produce food and those of us who buy it. Failure would be to recreate the power dynamics of the old economy. Just as we need to re-arrange what’s on our dinner plates by moving ocean greens to the center, we need to move farmers, food workers, communities, and protection of the planet to the center of our plate and push the destructive, unjust old economy off the table. We’re putting farmers and buyers on equal footing by negotiating with institutions to guarantee forward contracts so that we get paid before we grow, and if our crops fail, then both the farmer and the buyer share the loss. It’s time for everyone to share the risk in the risky business of growing food in the era of climate change and globalization. The relationship between farmer and buyer has to go even deeper. Reformatting the food system is going to be costly; it’s going to be complex. Simply using purchasing power will not be enough. Anchor institutions such as hospitals, universities, wholesalers, and retailers have a new role, a new set of responsibilities in the new economy. They have a duty to invest aggressively in our farmers, our infrastructure, and our communities. This involves donating a portion of their profits and their endowment to building hatcheries, seafood hubs, logistical and transport systems, incubation, and R&D. This will mean less profit for the private sector and a lower rate of return for universities but more value in terms of social and environmental good. All around us we can see that “business as usual” will not save this planet. It’s time to divest from the old economy and invest in the new. Finally, we are insisting that markets reward the positive externalities of our farms. We’re working in places like Connecticut to include ocean farmers in existing nitrogen trading programs. New farms are being built in polluted areas like Bridgeport and the Bronx River in order to soak up the nitrogen and carbon, pull out heavy metals, and re-build reefs. Instead of harvesting food, these farms harvest ecosystem services. While others pollute, we restore—and as farmers we should be paid for the positive externalities of our work. In the new economy, markets have to reflect the environmental benefits we provide. In 1979 Jacques Cousteau, the father of ocean conservation, wrote: “We must plant the sea and herd its animals using the ocean as farmers instead of hunters. That is what civilization is all about—farming replacing hunting.” This dream of Cousteau’s and of GreenWave’s is frightening to some environmentalists. The idea of hundreds of ocean farms dotting our coastlines and the idea of 3D farms embedded in wind farms are unsettling to many because of the scale. As a result, the instinct of environmentalists is to do everything they can to protect the oceans from any and all forms of economic development. They shield themselves with a “politics of no.” I’m very sympathetic to these fears, especially given the history of industrial aquaculture in the 1980s; yet in the era of climate change, it’s an illusion for environmentalists to think they can save our seas by relying on a conservation strategy alone while continuing to ask the oceans to feed our hunger for wild seafood. Conservation represents its own form of climate-change denial. We all know it’s real, but the true significance, the implications, the urgency haven’t sunk in. Just look at what’s happening on land and sea: rising water temperatures and acidification threatening one out of four marine species with extinction; drought and extreme weather expected to make U.S. corn prices go up by 140% in the next fifteen years alone, while agriculture is responsible for one-third to one-half of all carbon emissions and uses 80% of the fresh water in some areas, making it the primary cause of droughts, rising food prices, and food insecurity. If there is one lesson we should learn from the water wars in California in 2015, it’s that our food system is going to be driven out to sea. Yes, we need marine parks, but we could set aside the entire world’s oceans, and our ocean ecosystems would still die. Conservation alone is no longer environmentalism. The climate crisis demands that we use our fears as a catalyst for change. For the first time in generations, we have an opportunity to grow food the right way, provide good middle-class jobs, restore ecosystems, and feed the planet. This is the new face of environmentalism. As our food system gets pushed out to sea, we can come together to block privatization, to protect our commons, to spread the seeds of justice. We can invent new occupations, shift entire workforces out of the old economy into the new restorative economy. This is our chance to recruit an army of ocean farmers to grow a new climate cuisine that is both beautiful and hopeful so that all of us can make a living on a living planet. Q: In terms of decoupling ownership and management, I’ve never thought past the shoreline. I’m curious about what the complications are in the model you’re talking about. Who owns the oceans? How does that work? A: The wonderful thing about the oceans is that they are already owned as a commons. Our farms are leased from towns, states or the feds, depending on location. But regardless of where we grow, the ownership remains in the public’s domain. The important question going forward is how to create a lease model that both maintains community control and also ensures stability for the farmer. Through the democratic process at the town level, right now we have leases that place our farmers up for review every five years and lock in rates that are affordable at fifty bucks a year in order to ensure that they are not abusing their privileges. Our leases also require only growing restorative species. Another question is whether restorative species have any potential negative effects. Theoretically we could have so many farms at sea that they begin to soak up too much nitrogen and carbon, but that scale is unimaginable. We need only a tiny percentage of the ocean dedicated to farming to feed the world. The real issue at sea is the interruption of property rights as farms multiply, and that’s a serious challenge, which is why we want a process in place that protects community interests. When we go into a new area—we’re about to go to Santa Barbara, for example—we want to bring in all the stakeholders—such as the yacht clubs, the schools, the recreational fishermen—and create a process whereby they decide together that this is the right thing to do as well as where and how to do it. The only people who have generally been against this process are the conservationists. Those in the land-based food movement understand what’s at stake. Because they are familiar with land farming, they can see the whole picture, and they recognize the crisis on the land. The conservationists usually are in the Kennedy camp that was against a proposed wind farm off Cape Cod: they just don’t like the look of it. This is a knee-jerk reaction because sea farming has very little visual impact. Everybody else—from foodies to fisherman to policy makers to environmentalists who care about climate change—believes restorative ocean farming is a key part of the solution. In terms of the impact on commercial and recreational fishing, the best fishing in the area is around my farm. Historically there were trillions of oysters along our coasts; our coral reefs were oysters, and now they are all gone. With our farms we are mimicking these reefs by creating infrastructure for the ecosystem. Now, after a few years of farming, commercial fishermen are setting their gill nets around my farm. Q: How are you going to get Americans to fall in love with kelp? A: People like the wild taste of salmon or tuna, so aquaculture has traditionally tried to farm what everybody already likes to eat. We are taking a different strategy by trying to completely shift people’s taste towards what the oceans can sustainably provide. If we can do it with kelp, we can do it with anything because kelp is disgusting. I hate the stuff! It’s a real challenge to shift taste buds, but we have to do it, and markets will drive us in that direction anyway because it’s zero-input and therefore low-cost food. We like to say we’re going to make kelp a little more punk rock. One of the first mistakes I made was to take kelp to seafood chefs. They’re the worst ones for cooking sea vegetables. The way they think of it is way too narrow. Instead I took it to pastry chef Brooks Headley of Del Posto in New York City; he now runs Superiority Burger, a great place. Immediately, the first night, he came up with kelp noodles in a barbeque sauce with parsnips and breadcrumbs, and it sold out in an hour. That’s the way we’re going to make kelp the new kale. I forgot to say that he’s a punk rock musician. Q: I have been feeding my animals North American kelp for years. Is that the same thing? A: There are about 250 different varieties, so it’s hard to say. But kelp has been used in the Americas and Europe for hundreds of years. I’m in the process of writing up a Western culinary history of seaweeds that have been completely forgotten. The Italians used kelp all the time; it was used in my home in Newfoundland; there was a kelp highway that went up the entire coast of South America, where it was used throughout the cuisine. Farmers were using it on their fields, and I’ve got old paintings from the Depression days showing kelp. It’s been used right along, but it’s all been wild harvest. Now we need to shift because as we increase demand, it’s just a matter of time before we start clear-cutting the wild kelp along our coasts. We need to farm kelp, and luckily we can. When we think about what species to grow in our waters, the first step is to conduct a basic ecological system analysis to find out which native species are farmable and edible in each ecosystem along our coasts, then research which seeds can be raised in a hatchery and where there are existing markets. Our goal is to build a GreenWave reef model that is made up of 25 to 50 farms surrounding a seafood hub selling into stabilized regional markets and then replicate that up and down our coasts. That’s our vision for restorative ocean farming. Q: Do you have nutritional data on kelp? Obviously it feeds the fish, and we all know that fish are good for us, but do you explain to people that it’s not just delicious and sustainable and good for the environment, it’s also good for their body? A: I tend to stay away from health and nutritional claims when I talk about food because there’s just so much hype going on. Everyone’s claiming everything helps everything, from autism to cancer. As for the nutritional profile, we do have write-ups indicating, for example, that there’s more iron in kelp than in red meat and that it’s an incredible source of iodine. But the point isn’t just to eat kelp; it’s also to explore the ten thousand edible plants in the sea. There are other seaweeds that are higher in protein and Omega-3s, but we’re trying to use kelp as the gateway into an entire new way of thinking about the seafood plate. Also, in terms of convincing people to eat kelp, it’s important to remember that when you sell food, it’s not environmental claims that close the deal. Nutritional claims do to some degree for some folks, but it’s really the story and the taste. Then, over time you realize that taste doesn’t even do it because most people have terrible palates. What they want to do is talk about the meal they had, the story about what they ate, where it was grown. Through this process the kelp becomes a memorialization of the relationships people are building within the food system. When I stopped fishing and started farming, it was so boring. I spent my life chasing and hunting fish. That was an exciting, adrenaline-filled life, but now I’m just floating around in a little patch of ocean growing kelp, always knowing what’s going to come up. I now have more in common with arugula farmers than with fishermen. But it’s all right. I just had to adjust my nervous system to my new identity. All fishermen are hunters, and that lifestyle has to end, but as ocean farmers they can still own their boats, have no boss, live a self-directed life, succeed and fail on their own terms, and spend their life at sea. So when I talk to fishermen I tell them: “Listen, the fish are gone. We can’t hunt anymore, but we can keep enough of our identity that we can still write sea shanties about our work. We get to keep our culture. What I’ve done much of my life is learn from the mistakes made on land and bring the solutions out to sea. I figured I’d made a lot of progress, but now being here with Allan, I realize I’ve barely scratched the surface in terms of the deep thinking he’s done around agricultural transition. I learned so much today, and I thank you, Allan. I also feel as though in a way Allan and I are here to close the loop between land and sea. Too often our thinking has stopped at the water’s edge. We have a food fight on our hands, not just against centralization and corporatization of our food but also with the growing relationship between technology and food in Silicon Valley. Companies are hard at work inventing liquid food, 3D printed food, lab-raised meats to address the challenge that climate change poses to our food system. Many in the food movement believe we don’t have to worry because this type of tech food is going to taste so terrible that consumers will never eat it. I disagree. Tech food will surely be delicious food. I don’t doubt the tech industry’s power to perfect taste. The alternative to tech food, the food we all believe in, is restorative food—served with justice and social good. If both restorative and tech food are trying to address climate change, why not pick tech food if it tastes just as good? For me it comes down to a choice between the old economy and the new economy. In the old economy, a company creates a product that is sold to a consumer, and the company soaks up all the profits and all the benefits with its vertical integration. We are facing a future where tech food will be made by robots and automation. That’s the old economy. It cuts farmers out of the equation, it cuts the soul out of food, the beauty of setting your table and coming together with your family. Defending the values we cherish from the tech industry is, I believe, at the core of the fight for the future of food. Then there’s the social-movement perspective. Last year I took my boat to the people’s climate march in New York City. My little muddy boat was surrounded by yachts the size of this building. The march was a gorgeous moment. I was there with my little solution, just a tiny piece of the puzzle that could very well fail. But when I joined the march, I saw that there were people from every corner of the country, with what I think of as the politics of Yes. They weren’t saying just “Stop building the Keystone pipeline”; they were saying “Let’s install solar in the Black Mesa in New Mexico” or “Let’s do urban farming in Detroit” or “Let’s start co-ops in the coalfields of eastern Kentucky.” I’ve never felt all that comfortable in ocean conservation or even seafood sectors. But when I found the climate movement, which was coming together around the politics of Yes, I felt that I had found my family for the first time in my life.